The rapids of the Parkdale section of the Arkansas River are similar to those in Browns Canyon. Like Browns Canyon, the rapids are separated by calm pools, which allow boaters time to recover between rapids. However, if the water is higher, waves and rapids can be even larger than in Browns Canyon. Highway 50 parallels the river throughout this section. The Parkdale section provides the perfect warm-up if you plan to continue downstream into the challenging class IV-V rapids of the Royal Gorge. 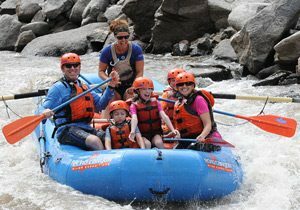 Tackle fun, splashy and swift rapids on this exciting full day section of the Arkansas River near Cañon City, Colorado – close to Colorado Springs and Denver. This trip is suitable for all skill levels, kids ages 6+ and is available from late-May to mid-August. This white water adventure is a great choice for families with younger kids that want a fun-filled day of adventure. Join us for lively and active whitewater on the Arkansas River near Cañon City, Colorado – close to Colo. Springs and Denver. 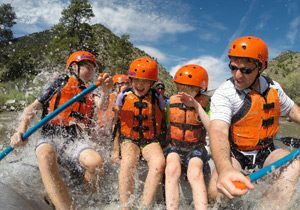 Enjoy the fast-paced, splashy rapids and beautiful canyon scenery on this trip suitable for all skill levels and kids ages 6+. Raft anytime between April and late-September. This is a fantastic adventure for families and friends! Notes: Good alternative to Browns Canyon, though not as challenging. Also, the second half of this section is typically the “warm up” before entering the Royal Gorge if you are rafting a full day Royal Gorge trip. Instructions: Sites are both undeveloped, with no signage or amenities. Use at your own risk.